FREE DRAW FOR A 50″ RCA LED TV THIS WEEKEND! Register for a Bidder Paddle on Sat or Sunday This Weekend and your name will be entered in the draw. Every time you bid, your name is entered again, every time you share our email notice, FB or TW your name will also be entered again. The draw will take place online on Sunday between 4:pm EST & 5:pm EST. The winner must be online to claim the TV through the live chat or email at the time of the draw. Online-Bidding | Auction Goes Live Tuesday, May 31st, 2016 at 7:00pm EST. New Inuit Art Auction Items Just In! Norval Morrisseau (1932-2007) ‘Original’ Acrylic on Canvas ‘Arrangements on Tan’ Circa 1976. 26×19 framed. Signed and Titled on Verso. Signed ‘Copper Thunderhead’ in Syllabics. Appraised and Certified: $9500.00. 4 Page Evaluation. Mixed Media on Board by Artists Jane Ash Poistras of Edmonton Aberta. Title: “Aint Got Nun” Approx. 20H X 17W inches. Approximate current market value: $4500 – $5000 , excluding taxes. 2016 Original Haida Art byartist: Jim Charlie ofHaida Squamish Nation “Sun Mask plaque”Dimensions: Approx. 29 inches diameter, Medium: Yellow cedar,Approximate current market value: $3000 – $4000 , excluding taxes. OriginalHaida Art “The Great Blues Heron”byartist: Harvey John ofHaida Squamish Nation.Dimensions: Approx. 26H X 9.5W inches.Medium: Yellow cedar andApproximate current market value: $1400 – $1600 , excluding taxes. “Best of Friends” Limited edition print # 955/1000, signed by artist Nori Peter. Approx. 25H X 28.5W inches, print 20.5L X 16.5H Framed. Approximate current market value: $1000 – $15000 , excluding taxes. The Inuit Co-operative Federations play an important part in life in the North. In some settlements in the North people rely on them for everything from water delivery and garbage disposal to the buying of carving for resale in the South. This story by Ipellie, which first appeared in Nunatsiaq News, gives some idea of how ritualized buying day at the Co-op has become for many old Inuit carvers. Nipikti was now an old man and took three times as long as any young Inuk to get from one point to another. Almost every week, he would get up from his small carving studio at home and start walking out to the Co-op where he sold at least a half a dozen carvings he had finished during the week. He hung the bag of carvings over his shoulder and started out the door, his walking stick leading the way for him. “This is the day I will get the upper hand of the deal with the Co-op manager. I have no doubt that he will fall in love with the carving I finished today,” he said as he closed the door behind himself. On the way to the Co-op, Nipikti would stop several times to rest his tired old legs by sitting on the same rocks he had sat on for the last twenty years or so. He got up slowly and continued on to the Co-op where he would get the money to support his family. The Co-op was still quite far away. “If I had my way, I would prefer to carve the stones and ivory to make toys for my children, and hunt the animals like I used to. I wasn’t such a bad hunter in those days,” Nipikti said to himself. He sat on Ojagakaluk and took enough rest there to make it to the next rock. “I shall see you again on my way back. Just make sure the bulldozer doesn’t push you under before then,” Nipikti shouted back to the second rock as he slowly started walking on. He then got up to walk the last leg of the trip to the local Co-op and said to himself that it was time to think about how much he would persuade the Co-op manager to pay him for his carvings. Especially for the good one he finished earlier that day. When he got to the Co-op, Nipikti took the six carvings out of the bag and laid them on the desk for the manager to look at. The manager picked up the carvings one by one and looked them over carefully. When he came to the carving Nipikti had done that day, he immediately offered Nipikti $120 for it. Nipikti stood leaning on his walking stick and counted on $150 as planned. Nipikti knew by experience that the carving was worth that much or even more, “$150,” he said. Nipikti looked at the manager’s face and thought about the last offer for $130. “If you think you are going to play games with me, you might as well be prepared to do it for the rest of the day. I am not going to play that long,” he said in Inuktitut. The manager clearly understood that Nipikti was not about to change his original asking price of $150. He knew that the price was right for the carving. But he decided to try once more to buy the carving for less than that. “$140,” he said. Nipikti just stood there and cleared his throat, then said for the last time, “$150″. And with that, he tapped the top of the desk with his right hand. It was a sign that he meant business. At that moment, the manager decided to give up trying to persuade the old carver to say yes to what he wanted and agreed to pay the $150 he was asking for. Nipikti had won the battle this time around. He took the money for the carvings he’d brought in and went out the door to begin his journey back home with his walking stick in hand and money in his pocket to support the family for the next few weeks. He looked across the land and saw that the three rocks where he sat to rest each week were still there. No one had started to build the road yet. And he just smiled and said to himself that it was good. I had better make sure that they do not bulldoze my rocks away. The way I see it, I am sure to win my case over that too,” he said for the last time, and he slowly moved toward home where he would start the next carving. Nipikti the old man carver lives on. Inuit Art Auction – Announcement! Due to the large number of consignments still arriving, and requests by bidders, this sale will now be broadcast Live in Real Time, and available for online bidding up until May 31, 2016. All bidders must be pre-approved for this auction sale. Under instructions received: we will offer for sale in detailed lots by Online & Live Webcast auction, a private estate collection of over 200 Original Inuit & Eskimo Stone Sculptures. Included, a 20-25 year old Inventory of Inuit Art Gallery, Original First Nations Art and West Coast “HAIDA” First Nations Indian Art From B.C. – Talking Stick, Masks,Eagle Head, Raven, Chief. Johnassie Faber (Greenland Artist) ” Sedna” (Sea Godes) Soapstone Sculpture- $35,000.00 Value. INUIT ART AUCTION Online-Bidding | Inuit Art Auction Goes Live Tuesday, May 31st, 2016 at 7:pm EST. Over 200 Original Stone Sculptures by esteemed artists: “Mary Kingatook”, George Aukaak, Norman Oupee, Alex Alikashuak, Simon Oleekatalik, Tony Ittunga Jr., Jonassie Papatsie, Kupapik Ningeocheak, Manasie Maniapik, Gideon Qauqjuaq, Anita Lavalle, Joe Pudlat, Andrew Palongayak, Jessie Nowyuk, Joseph Ouqqiaq, Charlie Okpik, Mary Kingatook, Haida Indian Art “Eagle Mask”; Collection of Hand Signed Christian & Norval Morrisseau Giclees – Family Foundation Sealed Artists & Publishers’ Proofs. Coins from Ancient Greece are some of the most sought after items for coin collectors around the world. Collectors take pride in the stunning edge-work on the coins. Portraits of leaders and Greek icons of a long ago time still carry their detail centuries later. Greek coin owners also can find enjoyment in the history and rarity of their collections, some coins date back thousands of years. Museums around the world have vast collections of valuable and ancient Greek coins. The American Numismatic Society collection holds an impressive coin collection which features over 100,000 Greek coins. The Greeks would bury money in order to save. This results in new coins being unearthed regularly throughout the old Greek empire, lots of exciting opportunities for collectors. Greek coinage can be divided into four distinct time periods, the Archaic, the Classical, the Hellenistic and the Roman period. Each era carries some noteworthy history and coins. Coins from ancient Greece tell the history of one of the world’s greatest civilization, spanning more than ten centuries critical to modern history. Coins were made of materials such as gold, electrum and bronze. Many collectors would argue that the high standard of artwork on ancient Greek coins was never duplicated by another civilization. Even after thousands of years the coins still carry striking artwork. Coins from the Sicilian area (fifth through third century BC) are often recognized for their artwork, while other experts believe coinage from the Hellenistic monarchs to be high points in Greek coin artwork. Both periods coins can carry strong values. Symbols on the coins varied from region to region. Coins found in today’s Afghanistan will vary greatly from coins unearthed in Athens. Images of Rhodes, Nike, Thebes and many other storied figures are stamped in coins. The Greeks were one of the first civilizations to issue commemorative coins. These special coins were issued to celebrate a military victory, or an achievement such as a scientific discovery. In a time before newspapers, these coins served as a way to spread a political message throughout the civilization. Collectors will be the first to say that Greek coins are different from any other ancient civilization. There are usually no dates or mint marks on the coins and the coins are rarer (and therefore usually more valuable). It’s fair to say that collecting ancient Greek coins will cost some money, but beginners can save by starting with lower cost bronze issues. Purchasing coins of lesser grades is also a way to save money in the beginning. 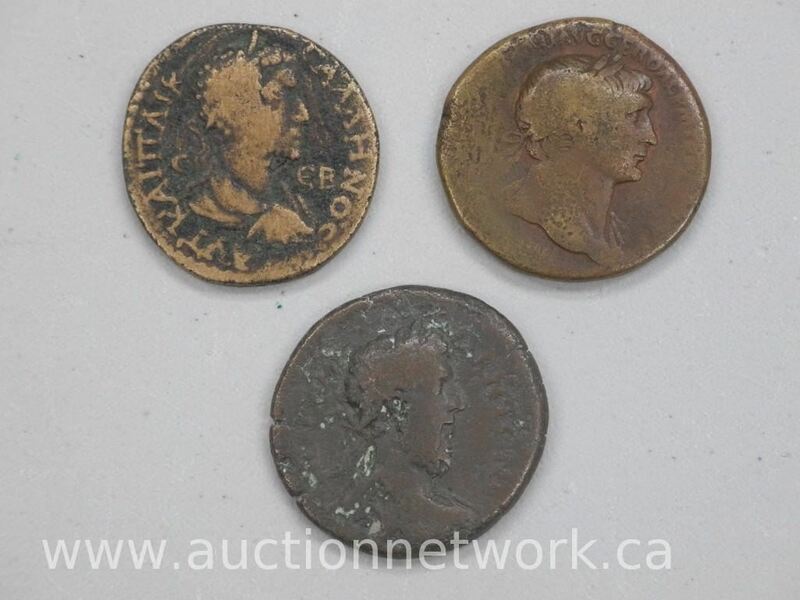 Auctions such our Toronto coin auction can be an excellent source for any type of Greek coin collection. There are lots of excellent books and online resources that provide information about starting an ancient Greek coin collection. Coins were handmade with care, not machine minted like other civilizations. This makes every coin truly unique. It’s important to focus your collection on coins that interest you. It’s best to have a couple of coins that you really enjoy, not a bunch of coin they don’t interest you. Collecting ancient Greek coins opens the door to some exciting experiences. Each coin tells a story, allowing you to explore the history of one of history’s most important and fascinating civilizations. There are coins that fit the needs of both new and experienced collectors. At the Auction Network, we too are coin lovers. We take a lot of pride in the great selection of ancient Greek coins we offer. These coins are featured regularly in our weekly online and live auctions. We look forward to seeing you at the auction! Original Carving West Coast ‘HAIDA’ Indian Art – B.C. ‘Eagle Mask’ Gallery: $6500.00. One of a Kind Original – View Auction Item Now. Original Stone Carving by Inuk Artist – ‘David Kingatook’ of ‘Taloyoak’ C1996. Gallery: $1600.00 ‘SEAL’ with Cert. Size: 10L x 6H x 5W. – View Auction Item Now. A girl would not take a husband, and at last her father in anger said that she would take a dog. One night a dog came in and took her as a wife. Over 150 Original Stone Sculptures by esteemed artists: Polar Bear by “ASHEVAK TUNNILLIE” $8700.00 Appraisal, “Mary Kingatook”, George Aukaak, Norman Oupee, Alex Alikashuak, Simon Oleekatalik, Tony Ittunga Jr., Jonassie Papatsie, Kupapik Ningeocheak, Manasie Maniapik, Gideon Qauqjuaq, Anita Lavalle, Joe Pudlat, Andrew Palongayak, Jessie Nowyuk, Joseph Ouqqiaq, Charlie Okpik, Mary Kingatook, Haida Indian Art “Eagle Mask”; Collection of Hand Signed Christian & Norval Morrisseau Giclees – Family Foundation Sealed Artists & Publishers’ Proofs. A private estate collection of over 100 Original Stone Sculptures. Included, a 20-25 year old Inventory of Inuit Art Gallery, Original First Nations Art and West Coast “HAIDA” Indian Art From B.C..
Below you will see a few samples of Inuit Art Up For Auction this month. Original Stone Carving Hand Made by Inuk Artist ‘Etuk Tikirik” of Lake Harbour, Circa 2006 “Drummer with Beating Drum”. Hand Signed with Cert. Approx. 7x5x3. Gallery $1800.00 – View Auction Item Now. Original Wood Carving ‘West Coast’ Haidi Indian Art ‘Coho Salmon’ Hand Signed by Wade Baker/ Gallery: $450.00. 13L x 5W. – View Auction Item Now. All bidders must be pre-approved for this auction. Jewellery Store Inventory Disposal: Gemstone Dealer Parcels, Gold & Sterling Silver, Diamond, Ruby, Sapphire, Tanzanite, Jade, Pearls, Atelier by Designer Michelle Merizzi, Watches and More! Sports Memorabilia w/ Hand Signed Jersey’s, General Merchandise, and Other Unique Collectibles. Below you will see a few samples of Items Up For Auction. Bank of Canada 1988 One Thousand Dollar Note. Auction Network is fully equipped with the latest technology in the auction business. In addition to live in-house auctions, we also stream our auctions live over the internet with spirited real-time online bidding. 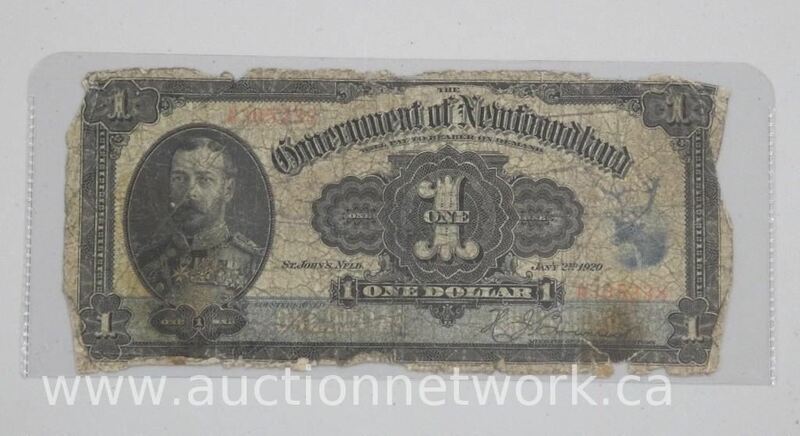 Coin Auctions, Inuit Art Auctions, Jewellery Auction, Gemstones, Gold, Silver, Bullion, Banknotes, Sports Memorabilia, General Merchandise and much much more! Join the family of auctioneers LIVE in-studio or BID LIVE, ONLINE, REAL-TIME (VIDEO/AUDIO). 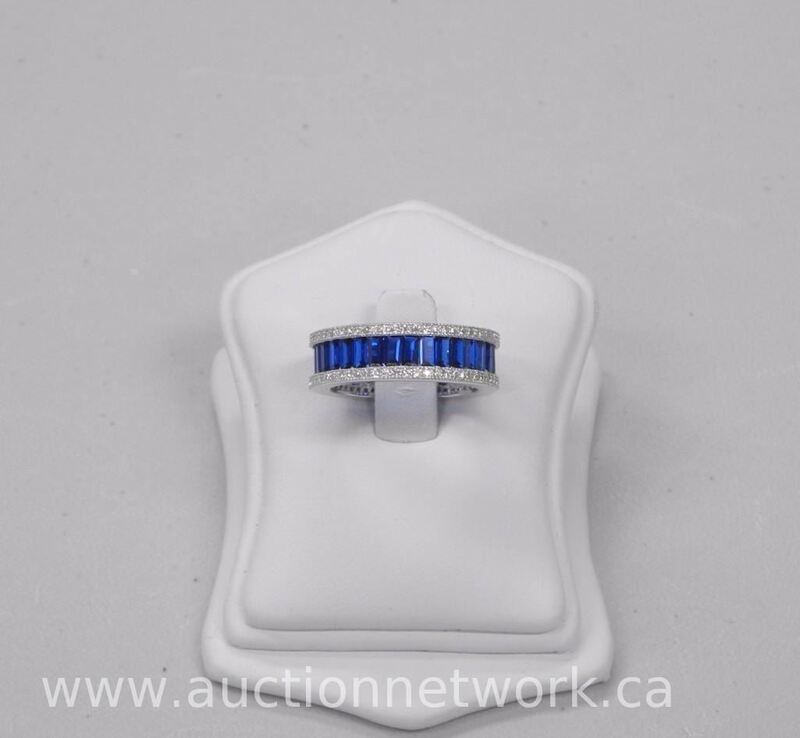 We are Canada’s Trusted, Live Online Auction House. All Bidders must be pre approved to bid in this auction sale. NOTES Canadian Banknotes, US & World Banknotes, and World Stamp Collector Albums, and more. COINS Gold & Silver Coins (Canada, US, World), Rare Collector Bullion, Royal Canadian Mint Issues, Searched and Unsearched Ancient Coins, and more. JEWELRY Gold & Sterling Silver, Diamond, Ruby, Sapphire, Tanzanite, Jade, Pearls, and more. ART Gallery Collection of Original Oil Paintings, Canvases, Lithos, Art Folios, Original Signature Items, and more. We are your auction professionals! Online-Bidding Only – Auction Closes Friday Eve., May 13th, 2016 at 10:00pm EST. Coins, Jewellery, Art, Collectibles, Sports, Banknotes, World Paper Money, Royal Canadian Mint Issues, Jewellery, Rings, Earrings, Bracelets, Necklaces, Nostalgia, Original Art, First Nations Art, Gold & Silver Bullion Coins, Certified Banknotes, Giftware, General Merchandise, Ancient Roman Coins & More. Estate Stamp Collection: 1935-1936-1937-1938 Europe. Don’t miss this auction we will be auctioning off a private estate collection of over 100 Original Stone Sculptures. Included, a 20-25 year old Inventory of Inuit Art Gallery, Original First Nations Art and West Coast “HAIDA” Indian Art From B.C.. This is an Online-Bidding Only Auction – The Auction Closes Tuesday, May 31st, 2016 at 10:00PM EST. Inuit Soapstone Sculpture by Artist: Nujalia Tunnellie.”Dancing Bear” Circa: 2009. Community: Cape Dorset. Signed in Cree. Size: 8H x 3W. On Sunday May 8th 2016 at 1:00 PM EST. Out Of Town Buyers Will Have The Jewellery Included With Their Shipment. You Must Be A Registered Buyer Online Or In-House And A MOM. View Our Weekend Auction Catalogues Here! Sports Memorabilia w/ Hand Signed Jersey’s, Carvings, Sculptures, General Merchandise and Other Unique Collectibles. All bidders must be approved for this auction. The approval process is prompt and you may pre-register now. Sports Memorabilia w/ Hand Signed Jersey’s, Carvings, Sculptures, General Merchandise, and Other Unique Collectibles. All bidders must be approved for this auction. The approval process is prompt and you may pre-register now. We are always accepting consignments. We are always accepting consignments. We look forward to seeing you online or in-person this weekend!